CM Services' Engineering Department focuses on creating responsibly designed projects that are comprehensive, sustainable and budget conscious while meeting the challenges of government standards regulating today's engineering design requirements. Attention to the environment and developmental impact of our projects is a priority in the direction of our engineering design. CM Services' survey team and site development engineers have a diverse range of competencies to handle from the simplest to the most complex development projects. In many cases we are able to gather original ground contour data without surveying the site. From the existing site surveying to initial planning and through the construction phase, the team at CM Services provides clients with top quality site development services. This project involved the study and design to expand an existing parking lot at Bentley Tower. A zoning study was performed for the residential dwelling and the expansion of the parking lot was designed to adhere to environmental performance standards such as slope stability, storm water management and soil erosion and sedimentation. The design also ensured that all off street parking requirements and standards were met while efficiently increasing the parking capacity of the building. Along with the site design, CM Services also provided construction administrative services once the project entered the construction phase. This project involves project development of a new 8,000 square foot multi-tenant professional medical offices on a very challenging site. The configuration of the property, site grades and zoning restriction, along with road way access, proved to challenge our design team to provide the most efficient use and layout of the property. This project is the first of numerous phases planned for the development of other medical office structures. By creating 3-D Building Information Models, we offer comprehensive building engineering solutions to maximize the value and efficiency of every project. We have experience in Green building design, LEED certifications and Net-Zero Energy design principles. This project involved the renovation of a historic structure built in 1929. The building will serve to house the main offices of TRIPIL as their headquarters and training center. The project includes design renovations of 27,000 square feet of an existing historical Elizabethan Style building with additions to be added for a new elevator lobby and porta cache and the construction of a third story addition for a multi-purpose room. The proposed project will be seeking LEED certification and have sustainable design elements implemented throughout the facility that included renewable energy resources, water conservation and green roofs. 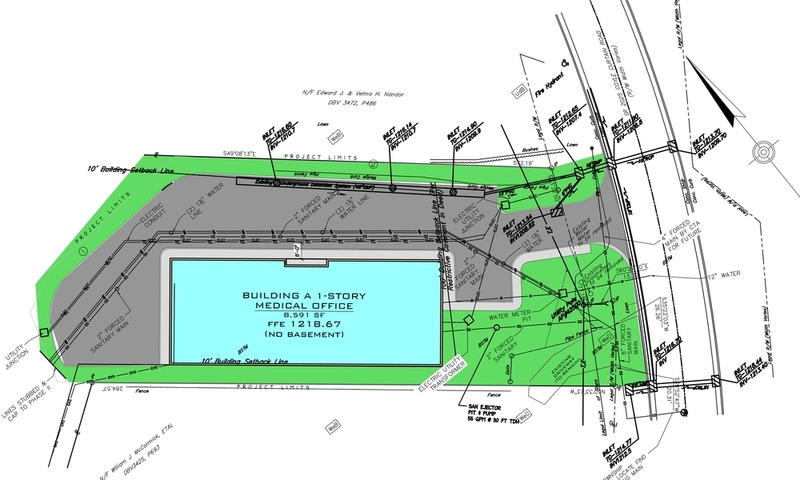 This project involves the redevelopment of an existing plighted 3 acre in downtown Washington,PA. The project includes rehabilitating 2 existing structures into a 15,000 SF Medical Clinic office facility and another 9,000 SF building into a Mental Health Facility. The project incorporates sustainable design features such as rainwater collection systems and bio-retention rain gardens for handling site stormwater, as well the building’s exterior and interior sustainable elements proposed throughout the design. The redevelopment of the site was vital to enhancing the entrance way to the City of Washington’s central business district. CM Services has extensive professional experience in the transportation industry, specializing in creating quality, long-lasting infrastructure designs for Public and Private projects. This project involved the design and construction of a new industrial park entrance roadway that included a new culvert roadway bridge. The size, type and location of the structure were all designed by CM Services as well as the foundations and all other site related aspects of the project. The project included the coordination of new infrastructure of utilities and new stormwater system for the new entrance roadway. CM Services Prepared a report that evaluated numerous options and sub-options with the goal to mitigate the flooding of the Washington Boulevard area of the Negley Run Watershed. The proposed alternatives were assessed for constructability; to identify obstacles that may be encountered during the construction phase to reduce errors, delays and overruns. The factors that were considered included but were not limited to: construction phasing, maintenance and protection of traffic, utility relocation, railroad coordination, bid-packaging, dollar volume, complexity and local work force. Subsequent constructability reviews were recommended to be performed throughout the design process at the 30, 60 and 90% levels of design and the local contracting community should be consulted at those times to recommend the most cost effective solutions. Cost estimates were also performed for each alternative using estimated quantities and historical unit bid prices from similar recent projects in District 11. All estimates were budgetary estimates for a future project in today’s dollars. Our energy modeling professionals create building energy models that provide valuable cost-benefit information while designing the HVAC systems for the project. We have extensive experience with whole-building energy modeling for both retrofit and new construction projects.